These are direct quotes found in the interviews of those who attended the 2006 Train Mountain Triennial. Located in the forests of southern Oregon is the world's largest hobby railroad. Imagine setting out for a ride on a miniature train and not coming back for two hours. The Train Mountain Railroad Museum's international triennial meet is their largest gathering. There were more 7.5" gauge steam engines and diesels than can be found at any other place at any other time. The variety of equipment was phenomenal. The steam engines ranged from geared narrow gauge engines to sleek superpower. Diesels from every generation could be seen pulling happy passengers through the woods. 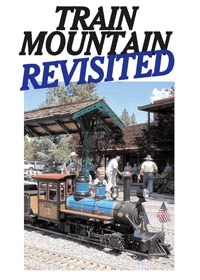 The Train Mountain Revisited DVD transports you to the event. While in the comfort of your own home, you'll visit every corner of the huge facility, and hear from first-time visitors and long-time veterans. And you'll see lots and lots of trains, including a 500-foot long freight train (that would be 4000 feet in the prototype) being pulled by an Atlantic, a Northern, and a Bigboy.